On the top, left and bottom you will have small sections with the middle right being the largest out of the four sections. On the top of the page, you can write whatever will help you to make sense of the notes you are taking, for example, the class they are for, the date, the main topic or theme or even your name. 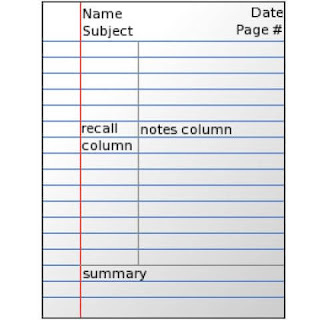 Cornell notes are effective because they enhance learning and prevent some of the forgettings that occur in most cases after taking notes or learning something. Taking those notes and filtering out the key concepts and theories as well as summarising them in a concise and clear manner requires to go over them. When taking notes in a lecture you will fill in the big part on the right with the ‘rough’ notes but you will not have time to go through all three steps while listening and taking the main notes. 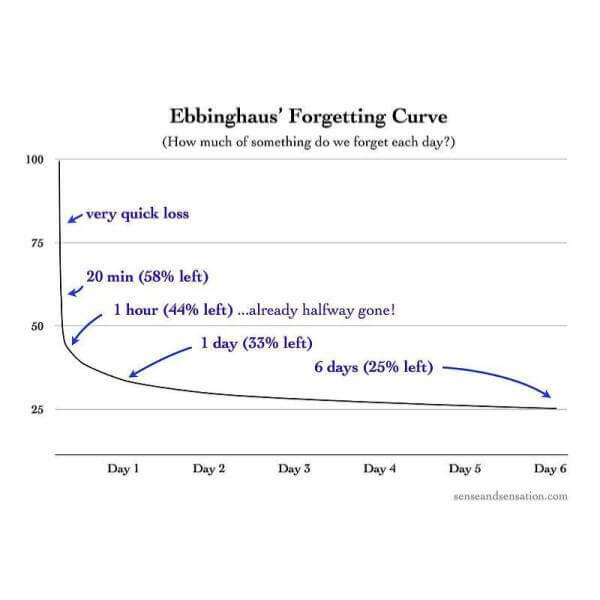 This is a crucial aspect of why this system is effective and it is linked to the so-called forgetting curve that Hermann Ebbinghaus discovered and published at the end of the 19th century. 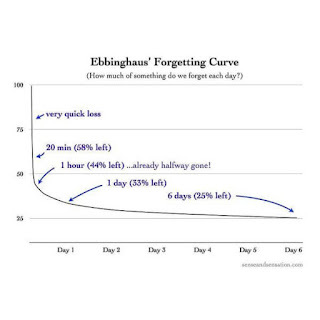 Indeed, the forgetting curve is actually a curve displaying memory retention of the nonsense syllables that Ebbinghaus taught himself. This curve illustrates that forgetting occurs very briefly after learning and that it is rapid first and then levels out. Going over the notes after even half an hour and then again after an hour will reduce the decline in memory retention of the information learned. This theory is still accepted today. To make the most of this note taking system, make sure to go over the same notes after a day and after a week. Going over them again on the same day only will not prevent forgetting. In fact, combining these two techniques - using the Cornell system and spacing out learning - will help you to avoid having to cram lots of hours into studying just before an exam because you could avoid some of the forgetting in the first place. You could even combine this system of note-taking with another study technique to further enhance your learning. It has been repeatedly found that self-testing and testing enhance the learning of information. So after going over the main notes, you could test what you remember without looking at the notes before checking whether you got all the points. Having the notes right there will equip you with the feedback needed to make this technique the most effective. 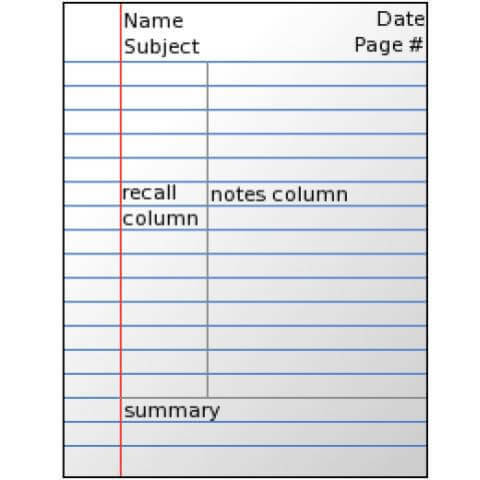 Using the Cornell notes system is very easy. All you need is a sheet of paper and a pen. You might find it the easiest to use a blank sheet of paper, but any sheet works as long as it is big enough to accommodate the four different section. After dividing the paper into the four sections, you can get started. It may take you a little practice to gain the confidence to use this technique as it requires you to focus on your understanding of what is being said rather than all the points that are being made throughout a lecture for example. You could also use this system when doing a reading for a class. Rather than copying out sections that you find useful and important or paraphrasing them, try to use the Cornell notes. Read a page, or two or indeed a chapter, depending on how dense the content is. Then take your sheet of paper and write down what you understood and what you need to remember. Then go through all the steps as discussed above and come to your summary. This will help your learning substantially as it forces you to encode the information by actually understanding and repeating it. The great thing about this technique is that it allows you to experiment with your note-taking style. For example, you could include a drawing, a sketch or a graph in your notes. You might also find it helpful to create a mind map physically connecting the notes you have taken and organizing them into topics and subtopics. When you are doing a task that requires you to take more specific notes then you could still incorporate this technique for the wider context. You could, for example, copy out one idea if necessary, and then use the Cornell notes to contextualize it using the rest of the reading or the lecture. As said before, test it out and give yourself some time to develop this technique to make it suit your needs. When covering different topics or subtopics in a class, starting a new sheet for each of these might be necessary due to limited space on a sheet of paper. Moreover, actively realizing when a new section has started and what notes could be combined into a new sheet will further enhance your understanding of the topic covered. The below video gives you an example of how to use the Cornell notes system. The teacher giving the explanations is a biology teacher, but the concepts generalize to all topics. Interestingly, there is also a quick run through of how to use these notes to study and revise for a test. When it comes to exam time and you are going over your notes, you might find it useful to take some additional notes. The Cornell notes do a great job at ensuring you have understood the material. They also do a great job at allowing you to filter out the main points at one glance whilst giving you the chance to look back at the main notes if needed. Nevertheless, you may wish to take notes of all the summaries for a particular topic for example. As always, try to work this method into your study and revision rhythm instead of forcing yourself to stick to this routine. If you are interested in finding out more about other study techniques, such as the SQ5R, an active reading technique, please feel free to check out the respective blog posts. A lot of these study techniques are easy to combine and are especially effective when used in such a way. If you want another way to help you with your studies, you should try a supplement, such as BrainZyme®. It has been touted "herbal Adderall" and "natural modafinil", and has been scientifically proven to support concentration, mental performance, motivation and the reduction of tiredness in under one hour. All while using naturally-sourced and vegan ingredients. For effects most similar to popular 'study drugs', such as Modafinil and Adderall, we recommend BrainZyme® Professional as it acts on the dopamine pathways in your brain, similar to how these pharmaceuticals do.